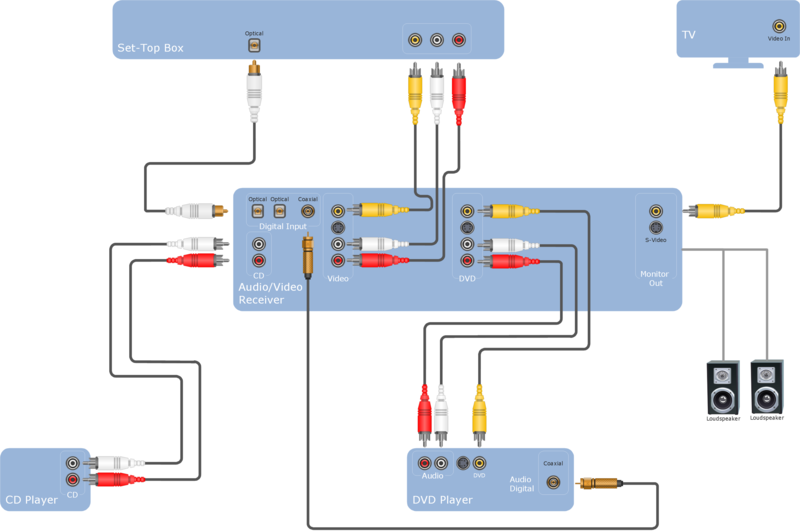 ConceptDraw DIAGRAM provides a numerous vector cable and connectors cliparts, examples, and templates for drawing different types of a audio and video connection diagrams. Audio and Video Connectors solution allows quick and easy diagramming the various configurations of audio and video devices. Sample 1. Hook-up drawing - Stereo audio visual entertainment systems. This hookup diagram was created in ConceptDraw DIAGRAM software using the Audio and Video Connectors solution. This hook up diagram example shows the common types of jacks and plugs icons and vector stencils you can use to illustrate your system’s configuration. The Audio and Video Connectors solution contains a set of video connectors, audio connectors and s video connection; you will also find pre-designed objects, libraries, templates, and samples, allowing quick and easy diagramming of various configurations of audio and video devices. Use the ConceptDraw DIAGRAM v12 software that has vector clipart of numerous cable connectors, examples, and templates for drawing different types of audio and video connection diagrams. Paste icon of the receiver or another device to page and layout sockets and plugs. Further connect plugs with each other, and now you have well-designed connection diagram. You can use text with any conceptDraw connectors to describe relationships between objects. Add text to connectors the same way you add text to any object - doubleclick a connector and type. Computer and Networks solution provides the libraries with large quantity of predesigned vector objects and the great number of templates and samples that will help design the Cable Networks in a few minutes.